In large bowl, mix chicken, jicama, celery and cashews. In small bowl, mix mayonnaise, mustard, curry powder and yogurt. Pour mayonnaise mixture over chicken mixture; gently toss to coat. Add salt and pepper to taste. Heat Belgian or regular waffle maker (to make 2 or 4 waffle sections at a time). Separate dough into 8 biscuits; press or roll each into 4-inch round. Depending on size of waffle maker, place 2 to 4 biscuit rounds at a time in hot waffle maker. Bake 2 minutes or until golden brown. Cool 1 to 2 minutes. 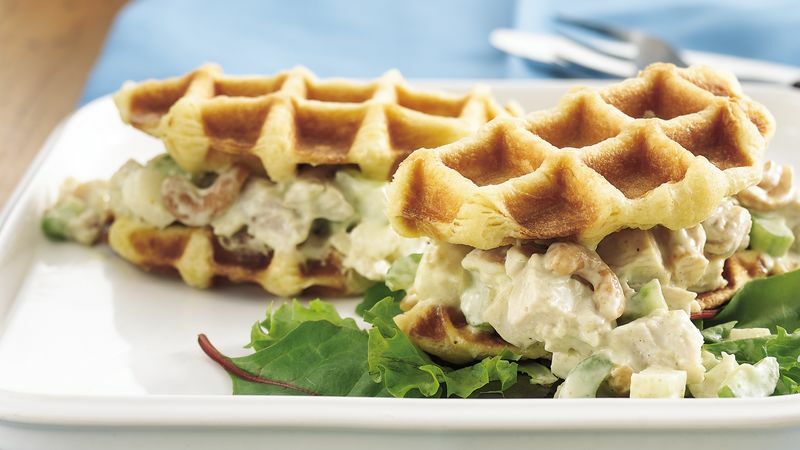 Spoon and spread 1 cup chicken mixture onto each of 4 waffles; top with remaining waffles. Cut sandwiches in half; place 2 halves on each individual plate. Serve with mixed salad greens.